Kramer’s art reveals her observations and reflections on humanity, nature, and the mechanical. She approaches art with the intensity of a sculptor, the sensitivity of a poet, and the insight of a critic. In this solo exhibition, each room in the gallery space is given a different spatial and visual rhythms. Kramer uses natural objects such as leaves, feathers, and broken branches as a starting point for her artistic ideas. She then uses commonplace but seemingly unremarkable materials such as coal and rust to create disguised representations of these natural objects. These created objects serve as vessels to reveal the invisible substances between matter––emptiness, space, airflow (the trajectory of leaves and feathers) and movement. The purpose of these artificial creations, however, is not to illustrate realistic details. 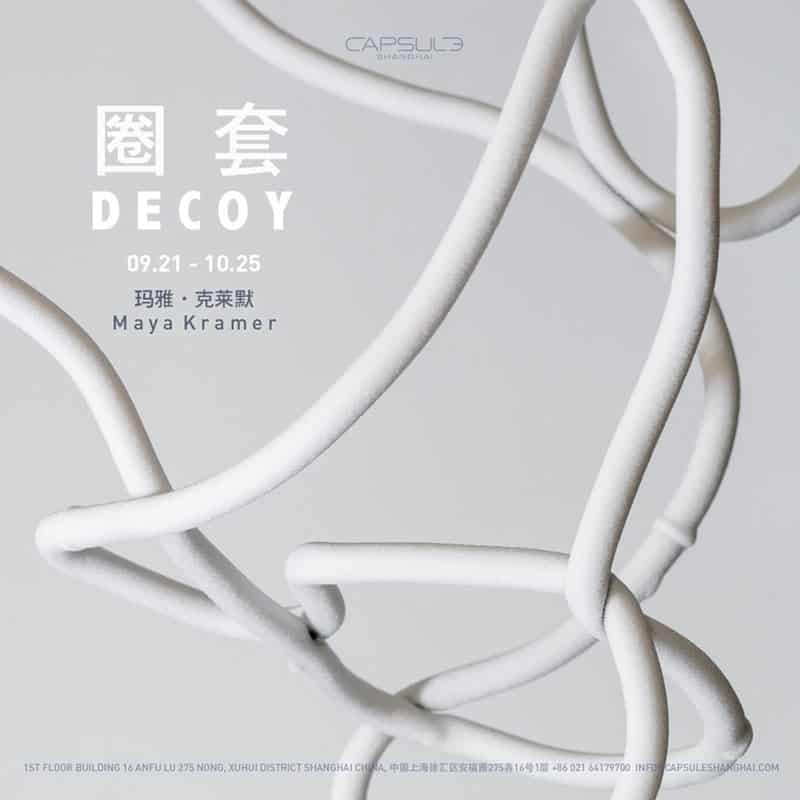 For example, in two of her sculptures of branches, Flashpoint (2018) and Closed Circuit (2018), Kramer makes generous use of white space and reduces minute details in order to make a lifelike object abstract and intensify its shape in space, which also reveals the artist’s lasting interest in exploring the theme of “emptiness.” This abstract, spatial examination is further developed in her latest sculptures Preserved I and II. This series of works is installed in the last room of the gallery. Upon entering, one immediately feels a sudden drop in temperature and space appears cramped due to its low ceiling which, to be precise, is a low blue and white patchwork with bits of the sky made from a collage of spray-painted paper (Piecemeal, 2018). Amidst the humming of a refrigeration compressor, the vapors on the pressurized copper tubing condense into frost and ice, which, when the compressor is paused, slowly melt into water spilling on the floor. While the frost and ice alternate between condensing and melting, the hues of the sculptures also shift from the brass color of bare copper tubing to a coating of translucent water or white frost. However, these new or still-evolving forms of objects do not merely serve the artist’s aesthetic purposes. As an observer and thinker, Kramer also reminds us that, on a deeper level, all changes occur from the conversion of energy––both naturally and from human activities. Interestingly, in order to pursue eternity and maintain a desirable state of perfection or usefulness, human beings must create and consume more energy to preserve the objects’ existing forms. The large amounts of electricity consumed will also be integrated into this exhibition––that is, a performance of objects––in varied subtle forms, including used materials and titles. Among them, the most notable element might be the sounds: the humming of a small fan motor muffled by the dripping of water droplets (Grey Zone, 2018), or the buzzing of a refrigeration compressor at work (Preserved I and II, 2018). For those whose ears have been trained by John Cage, the silence after a machine stops working is also a form of sound. Whether in an unnoticed background or in a silence that becomes more prominent thanks to an absence of noise, these sounds will inspire people to think and imagine beyond the norm. This is also a form of decoy.